Glenfinnan Estate is a stunning and beautifully located, privately owned, Scottish Estate. Set in Bonnie Prince Charlie country at the head of Loch Shiel 17 miles west of Fort William in the Western Highlands of Scotland, Glenfinnan Estate boasts one of the most dramatic settings for its modern lodge. The lodge has recently been completely refurbished and is now available as luxury self catering holiday accommodation. The Estate offers a wide range of leisure activities and is also used extensively as a film set location - especially for the Harry Potter films. 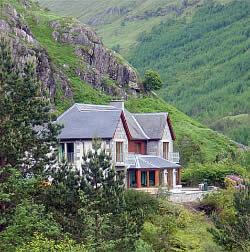 At heart, Glenfinnan is a working Scottish Estate with extensive forestry and stalking activities. For the visitor the Estate offers unrivalled scenery, wildlife, fishing and walking. It is also a perfect setting for small corporate seminars. For all enquiries, please email us on enquiries@glenfinnanestate.co.uk giving us brief details of your enquiry including name and if possible a telephone number. Visit Glenfinnan in the Spring or Autumn!